For over 20 years the Green Lake workshop has been turning out stunningly delicate, glimmery engagement rings that dazzle on the finger. We’re proud of that work and share it often, but we’re equally proud of the bigger wedding bands we forge and imbue with just as deep a meaning too. As with engagement rings, clients discover patterns, symbols, shapes and even locales to incorporate into bespoke wedding bands that commemorate their commitment. Here are 10 custom wedding bands you can’t just go out and purchase – these are that kind of rings that must be tailor made. We hope you find inspiration here to design your own! Hand carved wedding bands at Green Lake first start out as a sketch before a wax model is made to try on for both fit and feel. 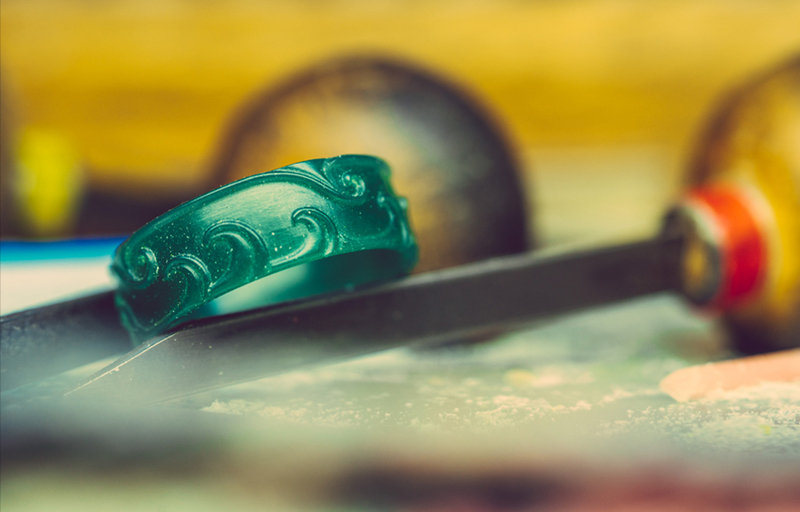 Once the design is confirmed, the model is then cast in plaster and heated to release the wax from its mold, where precious metal fills the void left behind and forms your ring. This ‘lost wax’ casting is how we create all our jewelry. Inspired by late Edo-period woodblock prints from Japan? 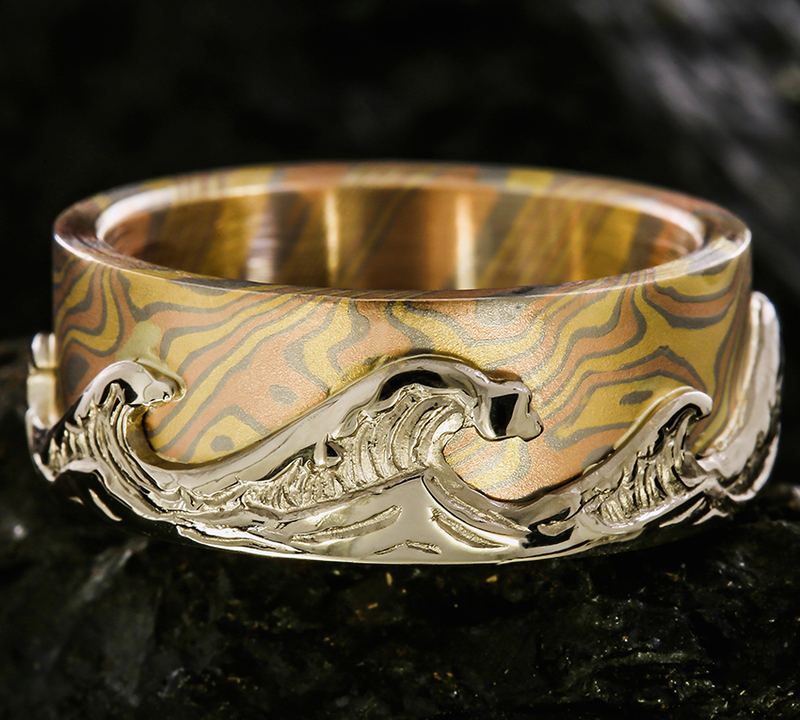 How about casting Hokusai’s Great Wave as a sleeve of 14kt palladium to surround a custom yellow and rose gold and palladium matte-finish band? Also doing it in the style of Mokume Gane, or wood-eye grain (the same forging technique traditionally used for katana blades) will certainly make clear your wedding ring has a story to tell. To make a design similar to this contact us at info@greenlakejewelry.com or start a Design Page. 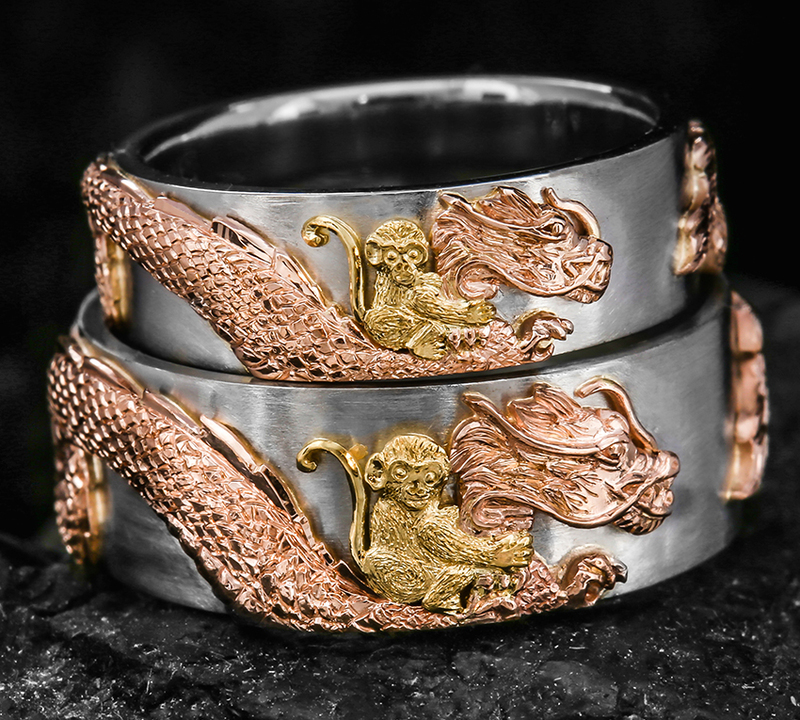 Continuing with East-Asian themes that incorporate mixed metals, how about a matched set of identical 18kt yellow gold monkeys riding dragons in 14kt rose gold around platinum bands with a sandblasted finish? Each element of these bands were cast separately and then assembled at the jeweler’s bench, where they were engraved by hand to be a perfect match. Sometimes when photographing jewelry, it’s easy to lose the sheer teeny-tiny scale of what our artists do. In this case, the gold monkeys on each band were about 1/8th of the size of a thumbtack! 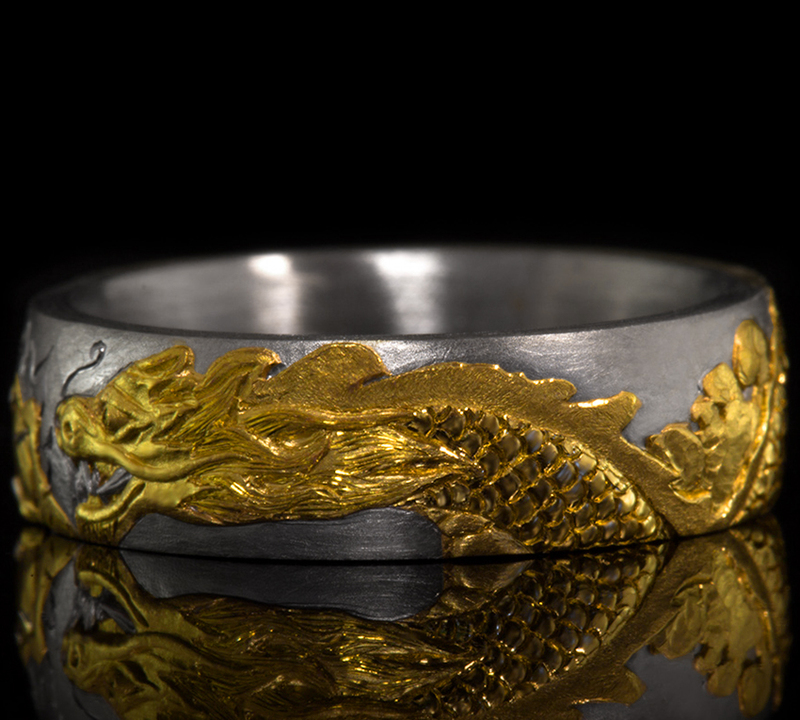 Nearly each and every ring from the Green Lake workshop drew inspiration from an earlier design, but this two-tone, hand engraved dragon ring was essentially the first of its kind. The approach and process of separate casting, inlay and ‘sculpted’ engraving were really developed for this project. While this piece is a one-of-a-kind, its method and overall look can be applied to all sorts of new designs. What is possible in combining a mix of old world techniques from totally different metalsmithing traditions? That seems to always be a topic of thoughtful consideration at Joe’s bench, where so many of these painstakingly engraved bands originate. 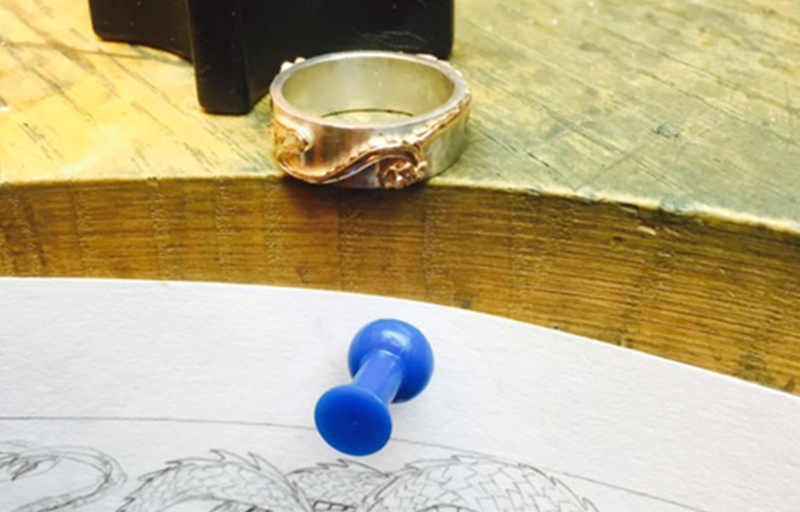 For this Koi-inspired piece, a hand fabricated 14kt palladium, white gold, and sterling silver Mokume Gane billet was used to form a band that was then relief engraved and inlaid with rose gold for a blossoming cherry tree on its backs side – watch how it was made HERE. Using a similar method of fabricating a Mokume Gane billet and forming it into a band (as was done with the koi ring above), this piece exhibits a cleaner and more simplistic approach to relief engraving. The ring’s platinum band with a layer of palladium and silver Mokume Gane channeled inlay has been cut into to reveal a wavy patterned accent, not unlike the stripes of a tiger…Rrrr! Want ornate relief engraving typically reserved for the receiver of a rifle, but on your wedding band instead (and at a microscopic scale)? No problem. This kind of scroll engraving represents one of the highest skills a metalsmith can possess, and in this case of incorporating yellow and rose gold inlay with bead-set diamonds, it’s kind of just bragging. 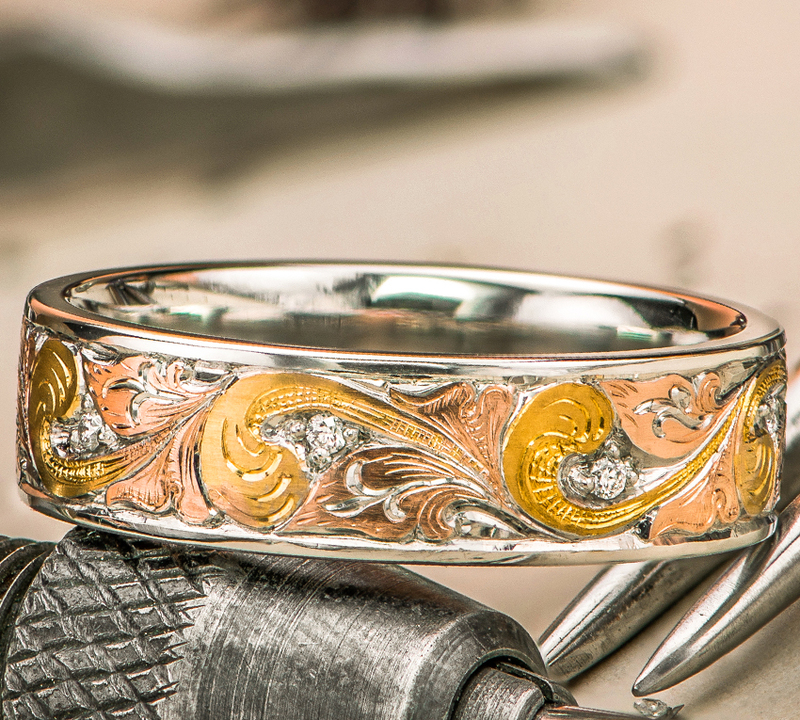 With hand engraving long, swooshing scrolls, there’s some forgiveness and leeway in line work. With landmarks renown for architectural precision, not so much. 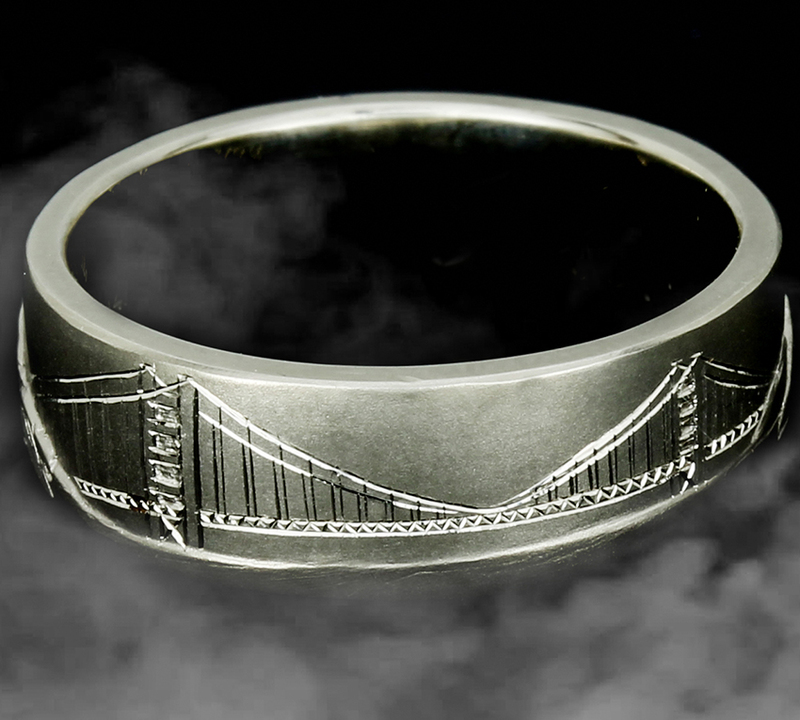 That’s why this hand-engraved wedding band depicting the Golden Gate Bridge in such crisp detail on white gold is so impressive. On the back, a hand-carved replica of Mt. Rainier. 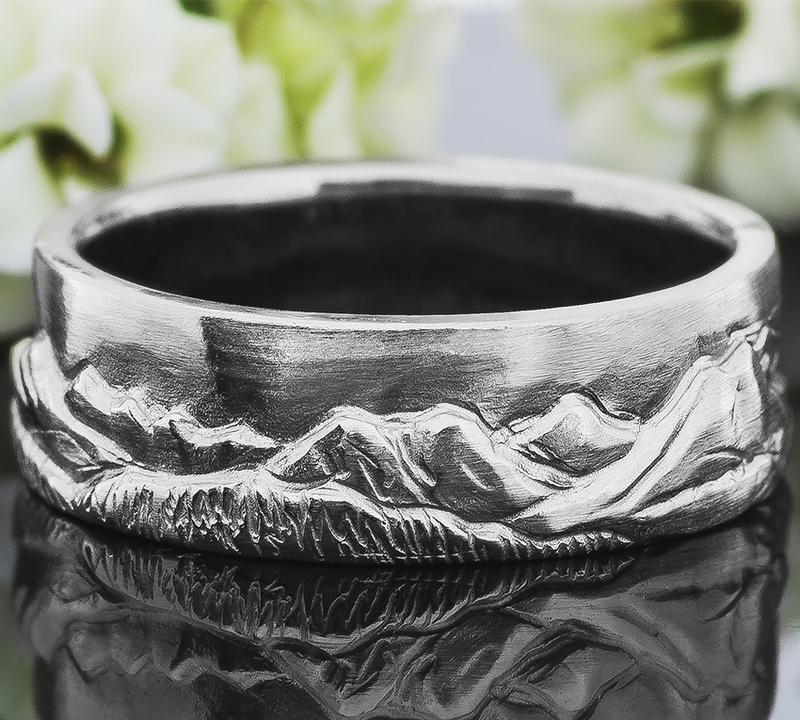 Many Northwest clients who’ve summited great peaks, especially as a couple, commemorate the adventure with wedding bands. So much so in fact, that Green Lake’s wax carvers could double as topographers for the world’s most famed mountain ranges, having detailed hundreds of slopes to scale over the years. 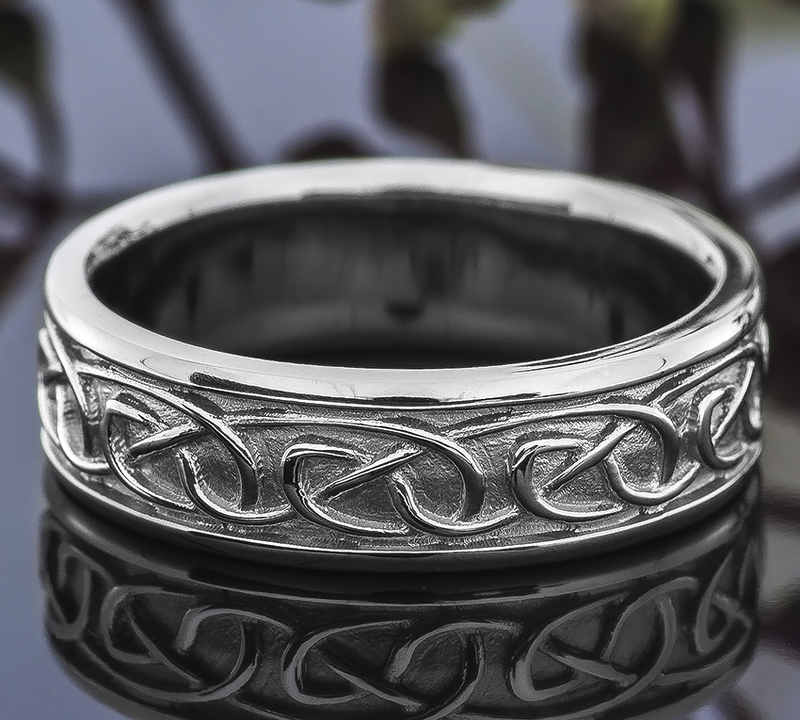 A well-made Celtic wedding band is all about perfect symmetry, the illusion of depth, and perhaps most importantly, an especially clean result. We find getting all of these twists and turns just so calls for 3D CAD precision and careful attention toward how recessed spaces will be perfectly cleaned out in the end. This way, both the pattern and negative space surrounding it become equally important elements in creating an authentic Celtic design. Being a Seattle-based custom jewelry company, many of Green Lake’s clientele work in tech and bring a lot of passion to what they do. 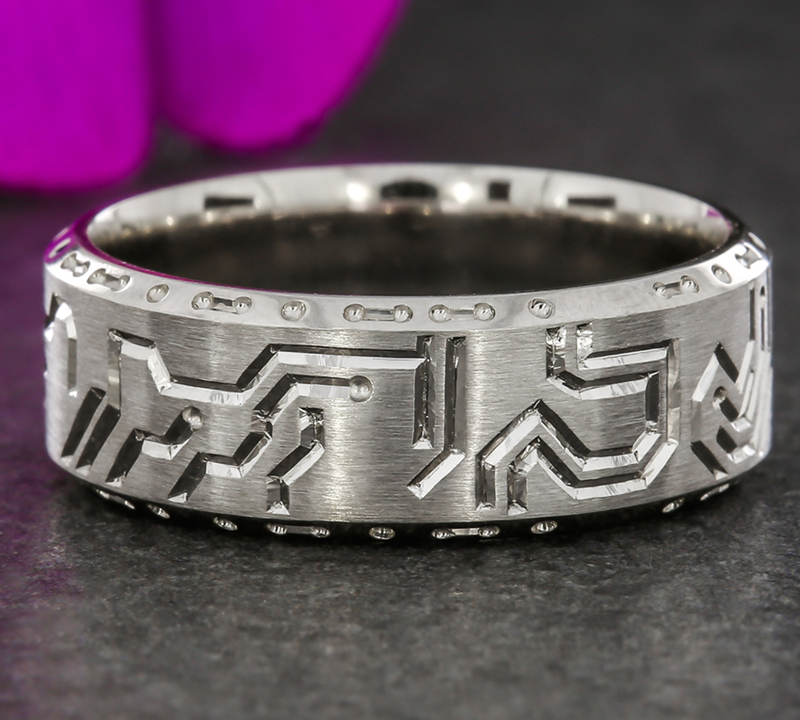 To customize a symbol of love and commitment, this developer’s one-off wedding band is hand engraved to resemble a circuit board. 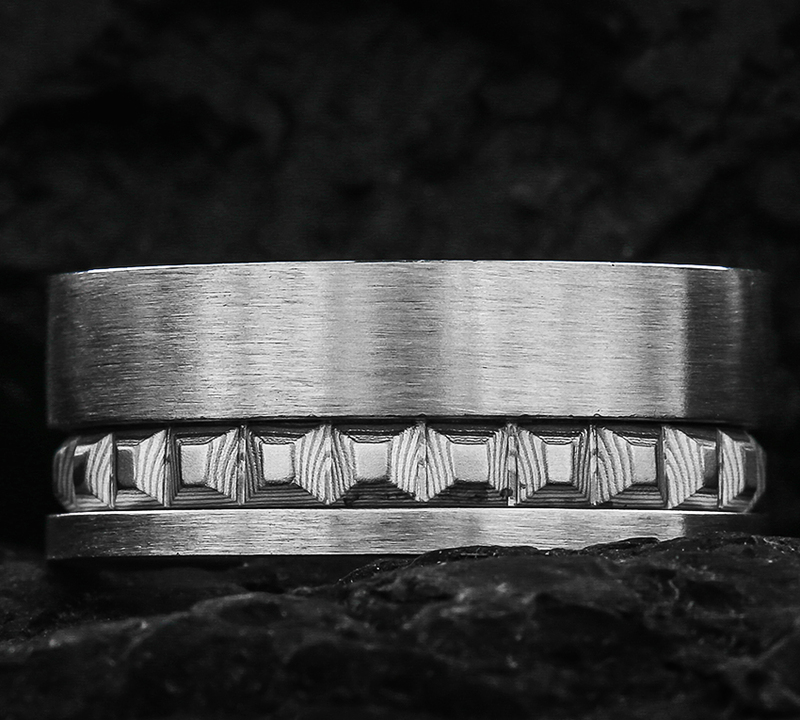 Bright cuts on a brushed finish lend just the right amount of flash to this ring, but it’s the binary sequences along the beveled edges which reveal a secret message that makes this piece so one-of-a-kind. 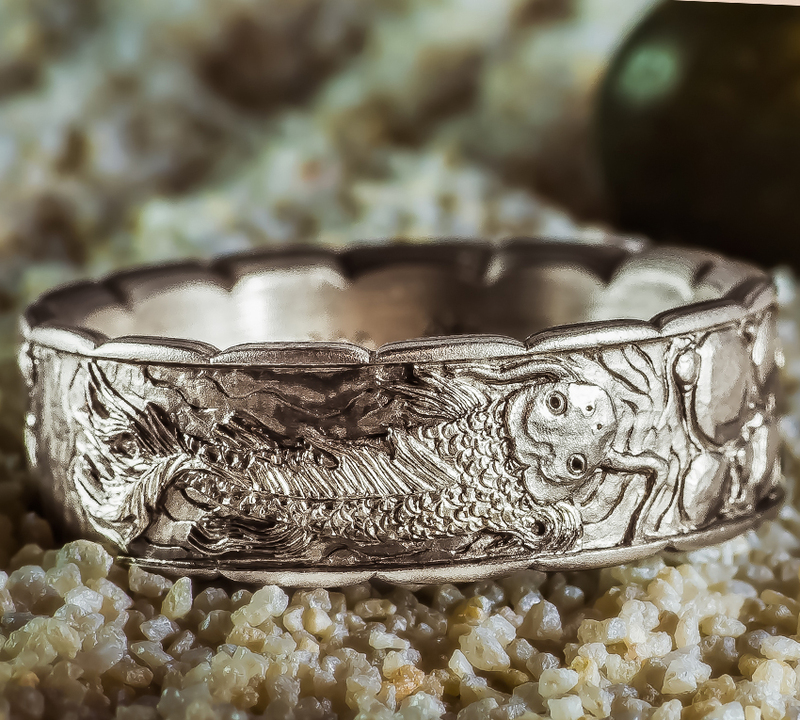 From unique combinations of noble metals to hand carved and engraved patterns to little-hidden messages, custom wedding band designs at Green Lake Jewelry Works are endless with possibilities. Whether you know a lot, a little or absolutely nothing about the kind of wedding ring you’d like to wear, designers here are as experienced as they are gifted in extracting ideas for inspiration. Contact us today at info@greenlakejewelry.com or start a Design Page HERE.